As you can see, CaFlyers.ca now serves you with its new theme and lots of new retailers. 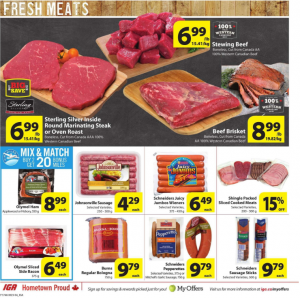 IGA is the just one of those retailers and in today’s IGA Flyer March 22 2017 there are many good deals on countless products such as Sensation Chicken Breast, Tray Pack Corn, Sensation Burgers and many more. With today’s flyer you have more ways to save than ever before ! IGA is the one of the greatest market in Canada, so if you are looking for the best place for your weekly shopping list, then IGA is the one of the best places to look at. We sure listed the best deal on this flyer just for you but you can always check out the deals by clicking the right hand side image. We just missed the 3 Days Sale on IGA but don’t worry, there are always more deals on IGA and we listed the best of them. Now let’s see the today’s best offers on IGA and start with the Fresh Meat options. In Fresh Meats section, we can found many good deals for meats, sausages and many more. 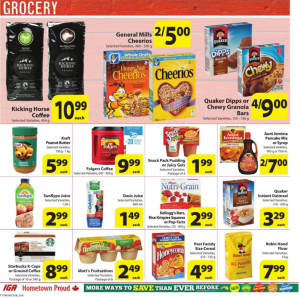 IGA offers you more deals on Grocery section so if you were looking for your weekly supplies on Groceries, then today’s IGA flyer is the one of the best choices you had. Now let’s see the deals on groceries ! As you can see, there are many good deals on various types of products and all you have to do is check this brand new flyer right now ! Just click on the right hand side image for more deals on IGA. You can always subscribe our news teller for daily deals and brand new flyers. See you next time !